Guess who’s back, back again. Madbro’s back…and this time with her fam!! I’m super excited to share with y’all all the new and exciting stuff coming to Una Bella Fortuna this summer. STARTING RIGHT NOW!! This summer, myself, Max, and the rest of my family are going to be going to some pretty cool places and after some brainstorming, Max and I decided we were going to combine my blog with his videos and create a blog/vlog social media presence. So now instead of my sub par pictures ((which will still be included, don’t worry)), we’re going to be posting videos on the blog as well as a youtube channel (pls subscribe) and an Insta!! (pls follow-@AmbroAdventures). This summer for Max’s high school graduation (where did the time go pls let me know), our entire family is heading to Hawaii for two and a half weeks. As most of you know, we’re not the conventional resort type; instead we rented a Jeep and we’re going to do what we do best: find the local hideouts, probably hike barefoot up a volcano, and most likely provoke a sea animal that will chase us out of the water (don’t worry, we’ll keep you up to date with all the trouble we will most definitely get ourselves into). Yesterday was our first full day on the island, and what better way to get acquainted than driving around and finding all the secret spots?? After an early morning adventure to Costco (YES THEY HAVE COSTCO!) to buy food and snorkel gear, we made ourselves a lunch and set out on our first adventure! For those who read my blog last summer, you know my obsession with finding out where the locals go (I have a legitimate fear of looking like a tourist). After reading about the beaches near us on the east side, we decided to head over to Aliomanu Beach, as it was recommended for snorkeling. After about a 15 minute drive, with 5 minutes spent bumping down a half paved road, we arrived at a dead end. There were address markers outside a few of the properties to explain that these were people’s homes and rental properties. Although we could see the beach, there appeared to be no public access and the private property signs were advising us to head back up that bumpy path we originally came down on. But right before we turned to head back, I spotted two rocks in-between two of the houses. With no apparent NO TRESPASSING or PRIVATE PROPERTY signs, I hopped out of the car and wandered towards the bubbling river that woven in and out of the dense trees. My dad called after me, warning that there probably isn’t a beach access and that we should just go to the other public beach we found. 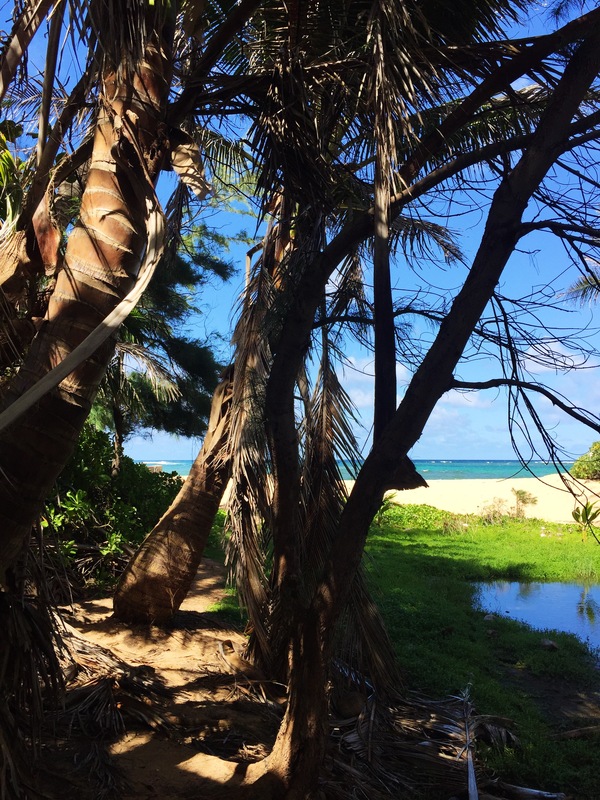 But I roamed on a little further and like a mirage in the desert, a jewel toned sea lined by a sandy coastline appeared at the end of the path. With a triumphant smile on my face, I skipped back to the car to prove them wrong. We quickly unloaded the Jeep and rushed to the beach, all while probably humming the Jurassic Park theme song through our heads (at least I was). To our surprise, the beach was completely deserted. 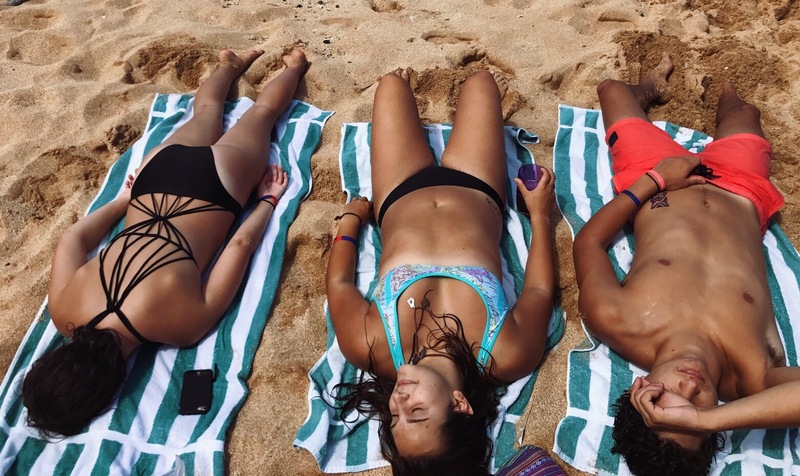 A beach day on a private beach in Hawaii? Yes please. We stayed for almost two hours, alternating between working on our tans and swimming against the rip current. With dinner plans at 6:30, we opted to check out the local surfing beach on the way back to our condo. We said goodbye to our private paradise, trekked through the mini lush jungle, and hopped in the Jeep. Pulling out of the half paved road, we were greeted with breathtaking views of dense green mountains, clear blue skies, and more chickens you have seen in your entire life. Yes this island is covered in chickens who apparently do not care if they are in the middle of the road and there’s cars honking at them. Why did the chicken cross the road? Because it can. Seriously, they like run the island here. 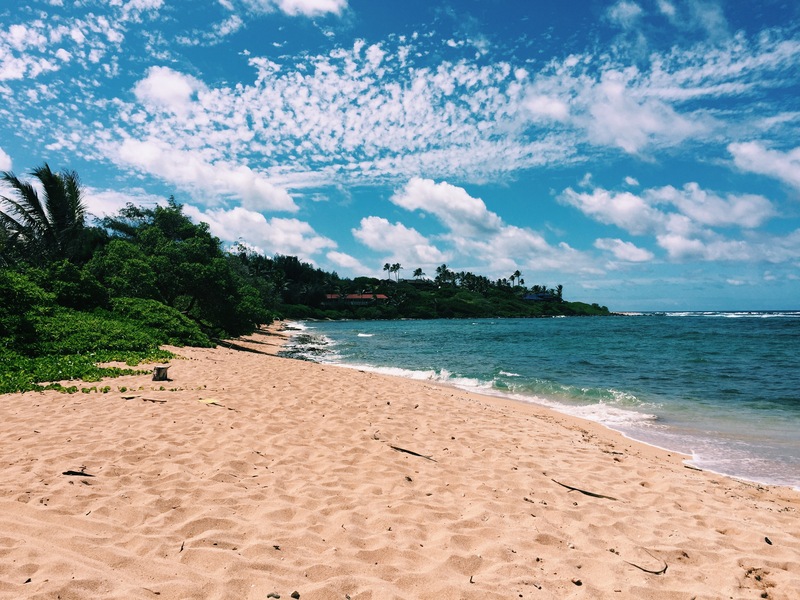 The public beach, Kealia, beheld wavy waters perfect for surfing and a shoreline to sunbathe while watching the locals catch the waves. Yes my first day in Hawaii was spent doing exactly what you expected me to do: finding a cute surfer boy that will fall in love with me and prevent me from every having to leave this island. I’m just kidding. Kinda. Not really. While accepting the fact I was still not a mermaid, I swam in the aquamarine water, body surfing and attempting to see if any of the surfers were cute up close. The day ended much too soon and we were forced to return to get ready for dinner, but the stunning views and delicious food at Lava Lava Beach Club made up for me having to leave the beach. I mean seriously, we ate dinner with our toes in the sand over looking the beach while the sun set. And when the moon rose and illuminated the waves? Stunning. 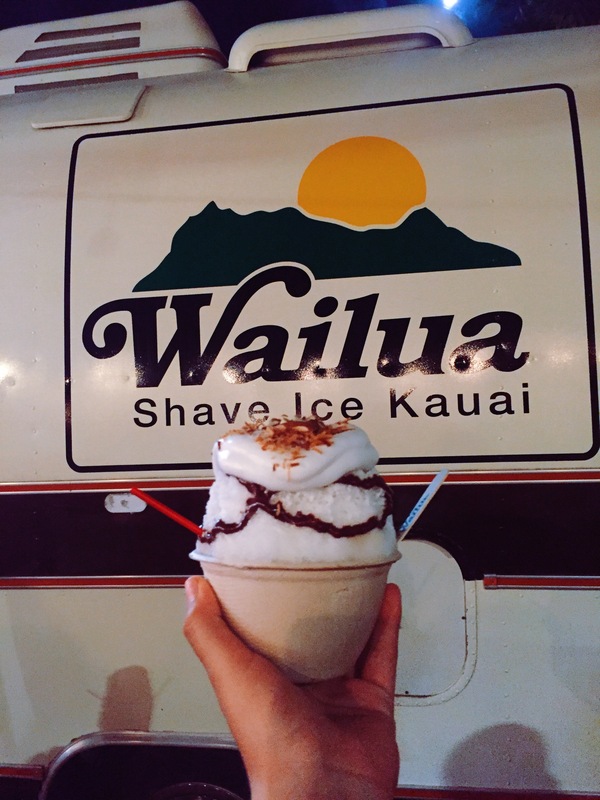 After dinner, we headed to Wailua Shave (yes shave, not shaved) Ice. 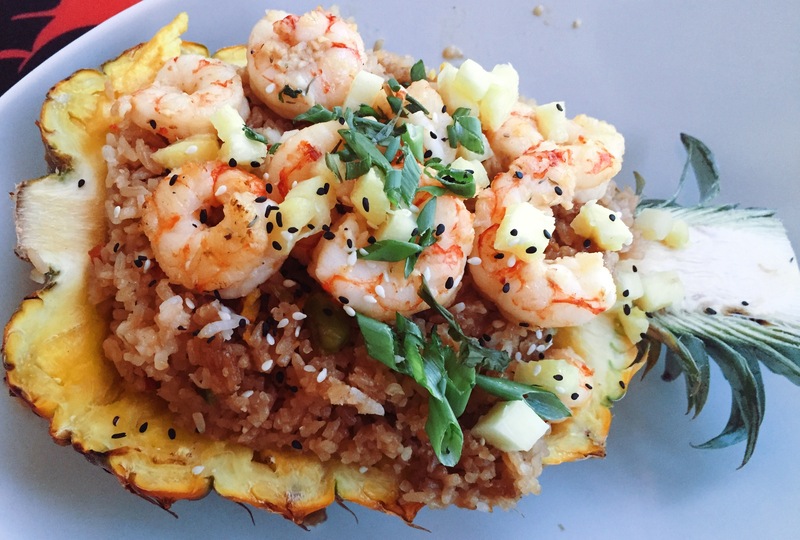 Everything here was concocted in house-no artificial colors, flavors, or sweeteners. The shave ice came piled high with coconut creme foam, toasted coconut flakes, chocolate syrup, and almond-hence the Almond Joy name. A spoon and a straw were inserted to make it appear as a shaka (ya know, the hang loose sign), and it was devored in minutes sitting at a picnic table under twinkling lights while watching old surf film projected onto the side of a van. Yeah good luck getting me to come home. Day two, today, will be spent hiking up Sleep Giant to see stunning views of the island at a higher elevation as well as kayaking up the Wailea River to the Secret Falls. See you tomorrow, and don’t forget to follow us on Instagram (@AmbroAdventures) and Youtube to see all our adventures! !